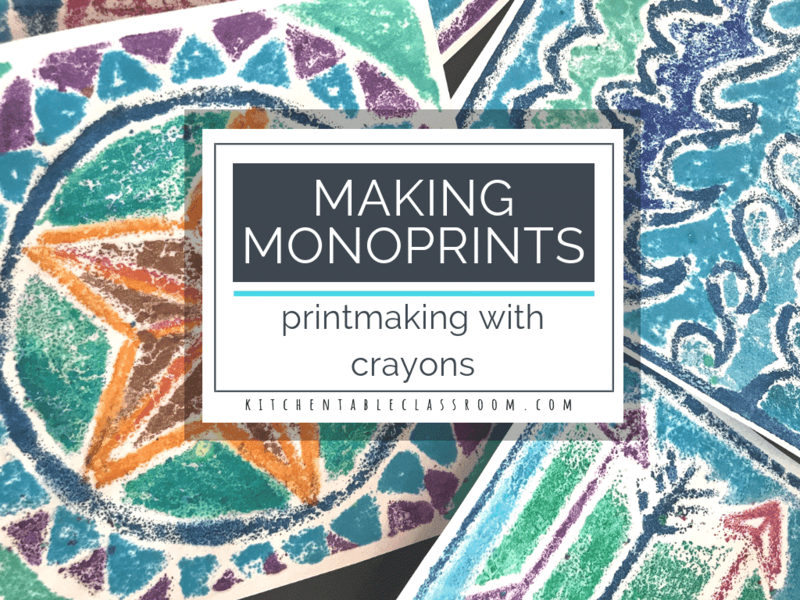 This monoprint process creates prints that are full of texture and color are brought to you by the starring players crayon and sandpaper. Crayon and sandpaper you say? That’s a weird combination. It may be but they team up to make an awesome monoprint. A monoprint means you can make just one print from each printing plate. In this case your printing plate will be sandpaper that you have colored heavily with regular old crayons. This project can be as detailed as you want it to be. Non objective swatches of color or a graphic design- they both work here. For this you’re gonna need an iron, crayons, plain white paper, and sandpaper of any grade. The more grit to your sandpaper the more texture on your finished print. Use what you have. This assortment of sandpaper would be enough for an entire class project. As far as crayons, any crayons will work. Because you’re coloring with some pressure this eats up crayons. Save your new box of crayons for another day. Grab that bin of broken, dull crayons and use ’em up. Start by cutting your sandpaper down to a reasonable size. 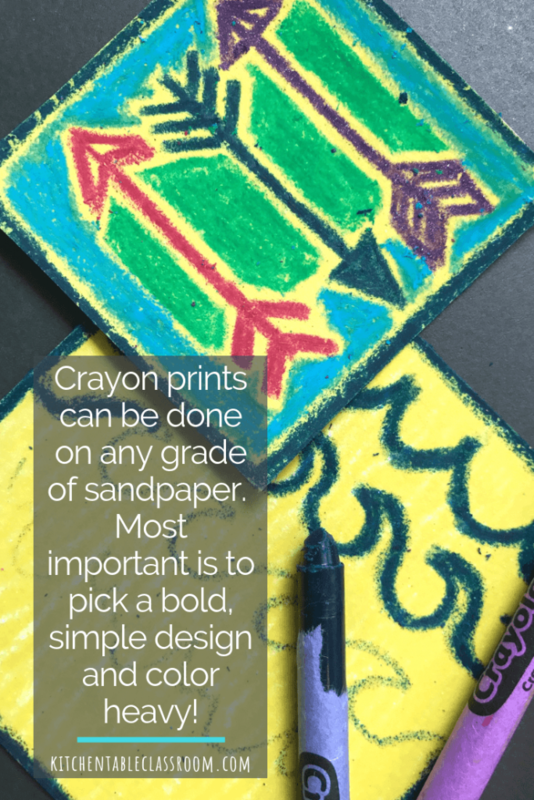 This project requires the crayon to be colored onto the sandpaper heavily. Little hands will get tired so choose your sizes based on that. If you’re working in a classroom setting you may color for more than one class session and could manage a larger size. If you’re working on your monoprint in one sitting I wouldn’t go any bigger than 5 x 5 or so. Any subject matter will do as long it’s colorful. 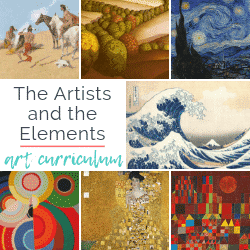 Encourage your kiddos to choose a subject that’s not too detailed. This isn’t the place for realistic details. I left a thin strip of uncolored sandpaper in between anywhere two colors meet. This is totally unnecessary; more of a stylistic choice. I think it serves to help unify the entire print but you can take it or leave it. When you’re happy with your crayon design it’s time to iron it onto paper. Preheat your iron to high. Lay your sandpaper down, color up. Lay white paper on top of sandpaper and cover that with either an extra layer of paper or a sheet of baking parchment paper. This is there to protect your iron from excess crayon soaking through. You know, in case you use your iron for actual ironing and not only crafting. 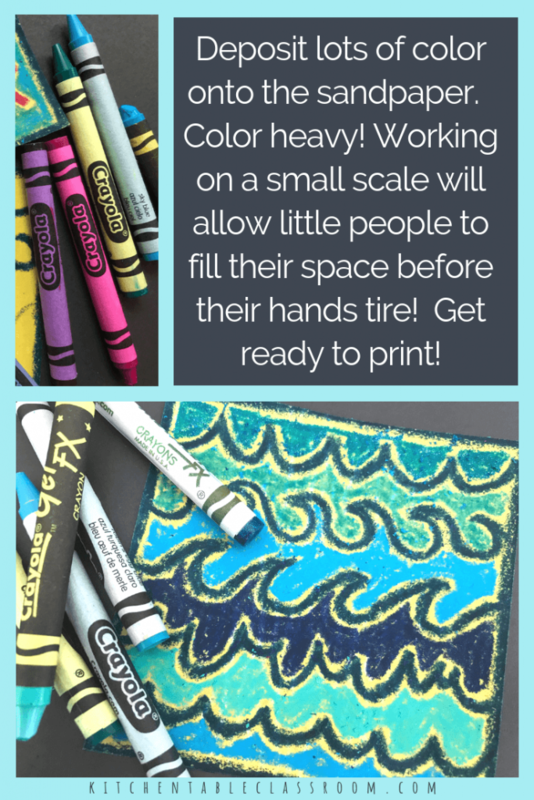 If you love this process but want to try printing with crayons and sandpaper on fabric check out this post! 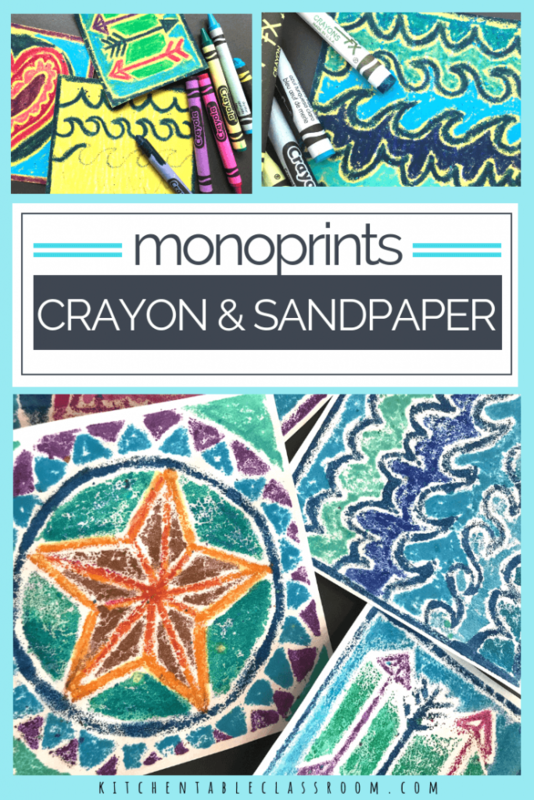 Peel off that paper, flip it over and you’ve got a colorful crayon monoprint. Depending on how heavily your monoprint was colored you may be able to sneak in one more monoprint here by ironing again on a fresh sheet of paper. If not it is always possible to use a piece of sandpaper more than once by adding new color to it! I love these as a printing experience and the results are so vibrant and colorful. It’s totally worth heating up your iron and digging out some leftover sandpaper! 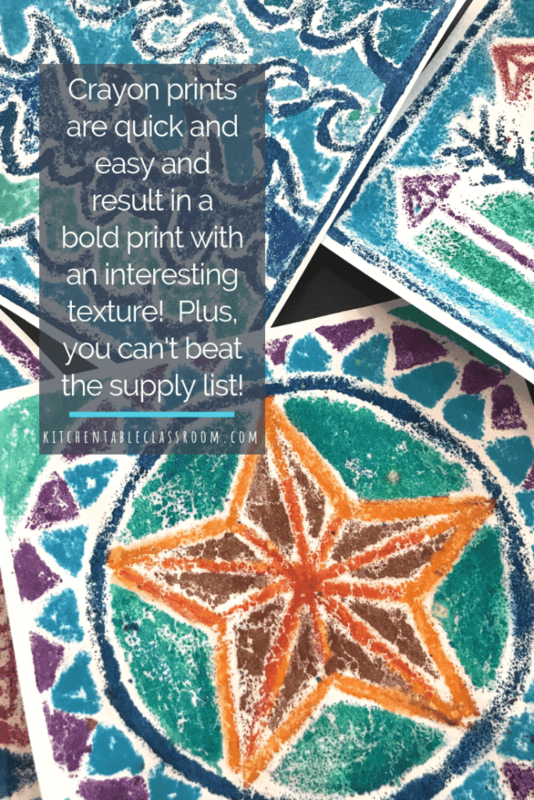 If you enjoyed this fun monoprint project please share on your favorite social media channel.